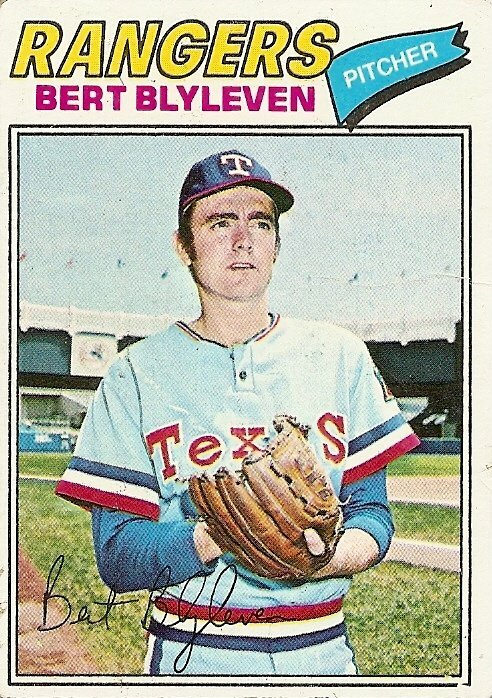 Bert Blyleven was born in Zeist, Holland, but only lived there briefly before his family emigrated to Canada and then California, where he grew up and where his father got his Hall of Fame caliber career started by taking him to see a game pitched by Sandy Koufax. I wonder if Blyleven’s father played baseball in Holland. Apparently, America’s national pastime is not as obscure in Holland as it is in other far-off lands: according to The Cultural Encyclopedia of Baseball by Jonathan Fraser Light, the Dutch have been playing baseball since a gym teacher brought back knowledge of the game after a trip to the U.S. in 1910, and the Dutch have perennially vied with the Italians for the honor of the top baseball power in Europe. My favorite Dutch player would have to be Win Remmerswaal, a pitcher who lived up to his given name three times for the Red Sox in 1979 and 1980, but, alas, I have no Win Remmerswaal baseball card in my collection, and so I turn to the pride of Zeist, Rik Aalbert Blyleven, to help me celebrate my upcoming belated honeymoon to Holland, now just two days away. Excited about this, I haven’t been able to write much all week, and today is clearly not going to provide a breakthrough on that front. Luckily I can merely pass along some of the deluge of great stuff written about Blyleven’s Hall of Fame candidacy in recent years by directing you to Bert Belongs, which features among many other highlights links to articles by Blyleven’s most eloquent and persistent champion, Rich Lederer (see, for example, “The Hall of Fame Case for Bert Blyleven”). I can’t really supplement any of that commentary except to voice agreement. What do I know? I’m just an aging cipher with a box of old baseball cards. All I can add is that when I got this 1977 Bert Blyleven card I most likely did not get the same immediate thrill I would have gotten had I found a Tom Seaver or Jim Palmer card in the pack. But I’m sure it grew on me. There was the name, first of all, sinuous and even a little hypnotic if repeatedly mumbled several times in the privacy of one’s room—Blyleven, Blyleven, Blyleven. And there were the numbers on the back, excellence partially hidden, camouflaged by the so-so won-loss record, the excellence more rewarding, even joyous, to discover. And last but not least there was the birthplace, more strange syllables to utter—Zeist, Holland, Zeist, Holland, Zeist, Holland—hypnotizing the chewed-gum nowhere day into something strange and wide. 1. Some things are a bit of a blur, but as a kid, I think I loved Blyleven because he was once captured wearing an “I Love Farts” t-shirt. And he should certainly be in the Hall. Have fun on your break. 3. If you had found a Paul Thormodsgard card would have continued on to Norway? 5. Blyleven is the best eligible pitcher not in the HOF. Everybody else in the top 20 in shutouts (Blyleven is 8th) is in, everybody in the top 10 in strikeouts (Blyleven is 5th) is in, and every pitcher who threw more innings is in the HOF. I think it’s either an anti-Dutch or anti-Canadian bias, that led to him inexplicable disappearing from Cy Young award ballots time and again, and now several idiots site his absence from Cy Young consideration as why he doesn’t deserve to be in the HOF. They are wrong: Blyleven is the best eligible pitcher not in the HOF and will remain so (if not chosen) until either Maddux, Pedro, or maybe Clemens becomes eligible (depending on what you think of steroids). On the Phil Lesh community fanboards, amongst varied discourse on Grateful Dead arcana, concert reviews, conversations on taping, equipment, and scores of music-related threads, there is a well-read and ongoing discussion as to whether Bert Blyleven belongs in the Hall of Fame. “In the Strangest of Places…” alright.